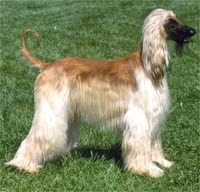 Despite his glamorous reputation, the Afghan hound is a hunter at heart, bred to chase down game over rugged terrain. While he maintains his regal bearings inside, he needs a daily chance to stretch his legs in a safe area. His worst trait is a reluctance to come when called. He will chase small animals outside; inside, he will coexist peacefully. The Afghan Hound is gentle with children and described by some as 'catlike'. He is independent yet sensitive and not overly demonstrative. He can be reserved with strangers; some can be timid. He has a gay, clownish side. The Afghan needs daily exertion, either in the form of a long walk followed by a short sprint, or preferably, a chance to run full speed in a safe, enclosed area. Although his coat might make him amenable to outdoor living in temperate areas, he needs a soft bed and is better suited as a house dog. The coat requires some commitment, especially when shedding the puppy coat; most adult coats need brushing or combing every two to three days.